Robert MacArthur is a name familiar to many undergraduate ecology students. MacArthur’s niche theory made important contributions to the theory of ecology by describing a model whereby in a community of species that competes for a resource, the total energy wastage will be minimised over time. Despite the importance of this theory to community ecology, it has received very little testing in real world situations. Giulia Ghedini and colleagues from the Centre for Geometric Biology along with Michel Loreau from France have used the well described, and easily manipulated, marine invertebrate, model system to test this theory. Giulia and colleagues were able to create communities that were of different ages or ‘successional stages’, by manipulating the timing of deployment of bare Perspex plates hung upside down within Brighton marina. Following MacArthur’s minimisation principle the team predicted that older communities (later successional stage) would have less unutilised food resources, higher maintenance costs due to metabolism and mortality, but with an overall net reduction of energy wastage. A real world application of this theory is understanding how susceptible a community is to invasive species. In MacArthur’s framework, late-stage communities (usually more diverse) have very little unutilised food resources, making invasion by an additional species very difficult. However, while there are many studies that find more speciose communities are more resistant to invasion, some studies show the opposite. But what if diversity is, in some cases, a poor predictor of resource use? Then MacArthur’s framework may help to better predict which communities are more susceptible to invasion. In order to test all the theory, the researchers collected the plates, that hosted the different aged communities and measured how much space they occupied on the plate, how much food (phytoplankton) they consumed, their metabolic rates (change in oxygen concentrations), and also recorded mortality by mapping individuals on each plate through time. Finally, they recorded the biomass of each community. So, do communities minimise the wastage of energy over time as MacArthur predicted? Giulia and colleagues found mixed support for MacArthur’s minimisation principle. While energy lost to maintenance increased in communities as they got older (due to these older communities having higher metabolic costs and higher mortality), the amount of unutilised food (energy wastage due to inefficient harvesting of available food resources) varied with successional stage and depended on the amount of phytoplankton that was available to start with. When food was abundant, the mid-stage communities were more effective at capturing this food, but when food concentrations were low, all communities performed poorly although there was some evidence to suggest that late-stage communities were slightly better at capturing resources. The team proposes several reasons to explain why their results do not completely correspond to MacArthur’s principle of minimisation. First, MacArthur’s principle holds true but acts over longer time periods and what Giulia and colleagues were measuring was an intermediate step where efficiency in food utilisation fluctuates with changes to the numbers and types of different species. Second, the principle might not hold true if competition is not the strongest driver of energy use in the community. Instead, other interaction types such as facilitation might be more important. In this example the high densities of barnacles in the mid-stage communities may have facilitated feeding by other members of the community by mixing the flow of water. Finally, it seems that more diverse communities are not necessarily better at capturing resources – which might explain why diversity can be both positively and negatively correlated to species invasions. However, we need more information before we can confidently predict how ecosystem processes and biological invasions change as communities grow older and how they will respond to changing environments. This research was published in the journal Ecology Letters. Unutilised food resources depended on both successional stage and food concentration (a) with mid-stage communities performing best at medium and high food concentrations. Energy lost to maintenance increases during succession as predicted by MacArthur (b) and the pattern in graph (c) suggests that unutilised resources (graph a) are driving overall energy wastage. Energy waste per unit mass declines in later successional stages but mid-stages have lower wastage than late stages particularly under high food concentrations (d). Intensive production of algae for biofuels, new bio-products and animal feed is of increasing commercial interest. Land based systems commonly cultivate single species of algae at high densities with periodic removal of biomass for commercial uses. While we know that such intense harvesting regimes can effect the evolution of size and growth rates, we don’t know if there are evolutionary consequences for the ‘quality’ of the commercial yield. 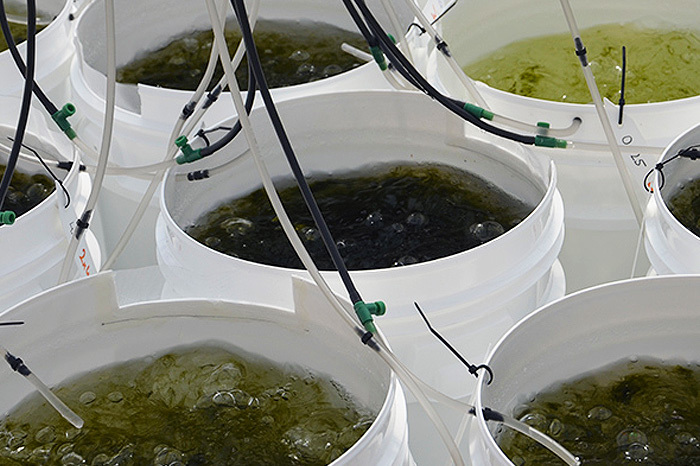 Recent research has investigated whether the overall productivity of desirable biochemical components in algal culture, such as oils (particularly omega 3 fatty acids) and amino acids, will evolve differently with different harvesting regimes. To do this, the team used three strains of a freshwater filamentous algae Oedogonium, which they cultured in buckets at James Cook University in Queensland. 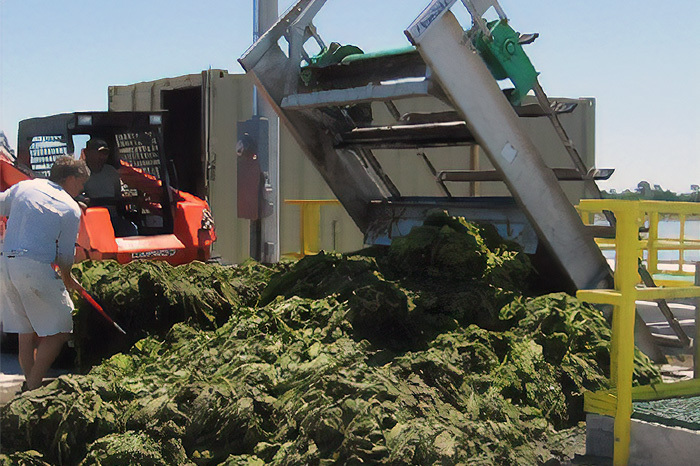 For each strain of algae, 10 replicates were assigned to a high yield (approximately 70% of the biomass was removed each week) or a low yield (approximately 20% of the biomass was removed each week) harvest regime. After 12 weeks all replicates were treated the same, in that approximately 50% of the biomass was removed weekly for a further four weeks. The research team included colleagues from The Centre for Geometric Biology (Dustin Marshall and Keyne Monro) working with scientists from James Cook and Southern Cross Universities. Dustin and his colleagues found that there were a number of changes in the biochemistry of the algal strains after 12 weeks of different selection regimes (high yield and low yield) but more importantly, after a further four weeks of identical selection, differences persisted for one amino acid (lysine) and most fatty acids, implying an evolutionary shift. Intensive harvesting of algae is becoming more common but the evolutionary implications are not completely understood. Experimental cultures of algae were maintained at different harvesting regimes (high yield and low yield) to explore the consequences for the production of commercially important biochemical components of the algae. 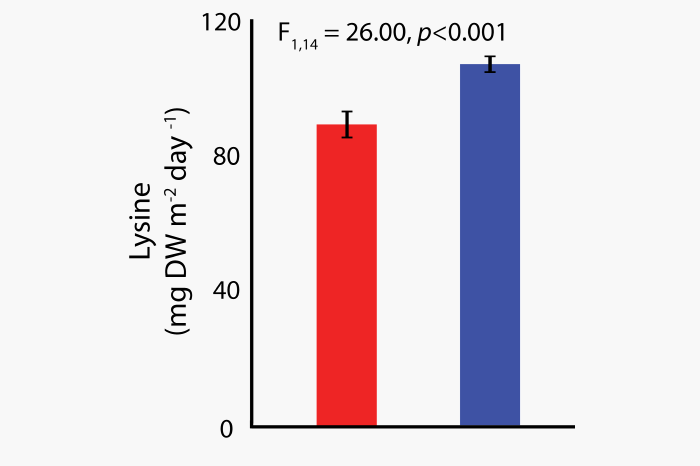 Researchers found that certain desirable products, such as the amino acid lysine had lower productivity when subject to an intense harvesting regime (red bar). These findings present a conundrum for producers: on the one hand intensive harvesting leads to more rapid growth rates, higher protein production (initially at least) and higher biomass yields over all. On the other hand, productivity of other desirable products (such as fatty acids and lysine) goes down. While this study suggests that the burgeoning algal culture industry should pay attention to the role of evolution in intensively harvested cultures, it also suggests a solution. By maintaining ‘mother cultures’ of algae held under a low harvest regime, the operators will be able to restart their cultures periodically to minimise the negative consequences of biochemical evolution. This research was published in the journal Evolutionary Applications. The Centre for Geometric Biology entered its third year in 2017. It has been an extremely busy year with many research highlights. The different research groups are working with a variety of organisms and approaches to explore a wide range of specific questions about organismal growth. There has been a palpable feeling of excitement as the different research streams and collaborations are starting to come together under the unifying theme of energy acquisition and use. Success in the realms of external funding and publications in high ranking journals has been excellent in 2017 and this applies to all career levels from PhD students to early career researchers and above. A meeting with board members and the Monash University internal review process has provided ample opportunity to reflect on our progress and identify where we want to be headed. A priority target is to improve the theoretical underpinning of our work. Successful visits followed on from theoretical ecologist Professor Andre de Roos in 2016 (University of Amsterdam), with visits from mathematical modeler Professor Tim Coulson (University of Oxford) and theoretician Professor Troy Day (Queens University, Ontario) in 2017. These visits have all resulted in ongoing collaborations and I think we have all found them highly motivating. Finally, we would like to thank the board members and the internal review team for their ongoing interest and support of our research and of course congratulate all the members of the Centre for Geometric Biology for their many successes in 2017. Cultivation-independent surveys have shown that the desert soils of Antarctica harbour surprisingly rich microbial communities. Given that phototroph abundance varies across these Antarctic soils, an enduring question is what supports life in those communities with low photosynthetic capacity. Here we provide evidence that atmospheric trace gases are the primary energy sources of two Antarctic surface soil communities. We reconstructed 23 draft genomes from metagenomic reads, including genomes from the candidate bacterial phyla WPS-2 and AD3. The dominant community members encoded and expressed high-affinity hydrogenases, carbon monoxide dehydrogenases, and a RuBisCO lineage known to support chemosynthetic carbon fixation. Soil microcosms aerobically scavenged atmospheric H2 and CO at rates sufficient to sustain their theoretical maintenance energy and mediated substantial levels of chemosynthetic but not photosynthetic CO2 fixation. We propose that atmospheric H2, CO2 and CO provide dependable sources of energy and carbon to support these communities, which suggests that atmospheric energy sources can provide an alternative basis for ecosystem function to solar or geological energy sources. Although more extensive sampling is required to verify whether this process is widespread in terrestrial Antarctica and other oligotrophic habitats, our results provide new understanding of the minimal nutritional requirements for life and open the possibility that atmospheric gases support life on other planets. Metabolic theory: how does the cost of development scale allometrically with offspring size? One of the most fundamental patterns studied in life-history theory is how offspring size links to performance of an individual. Within species, larger offspring generally have higher survival, reproductive output and growth, and lower risk of predation and starvation. One key question that remains is why larger offspring outperform smaller offspring. The Centre’s Amanda Pettersen and colleagues Craig White, Robert Bryson-Richardson and Dustin Marshall explored one potentially widespread mechanism: how the costs of development scale with offspring size, using metabolic theory. Metabolic theory proposes that there is an allometric relationship between energy use (metabolic rate) and body size, where on a log-log scale, the slope of this relationship is less than one. Amanda and colleagues sought to explore whether the same pattern (i.e allometric scaling) occurs with offspring size, in order to understand how size affects the relative use of energy reserves throughout a critical life period. They measured embryo mass and metabolic rate throughout development, from fertilisation to hatching, in the freshwater fish, Danio rerio. 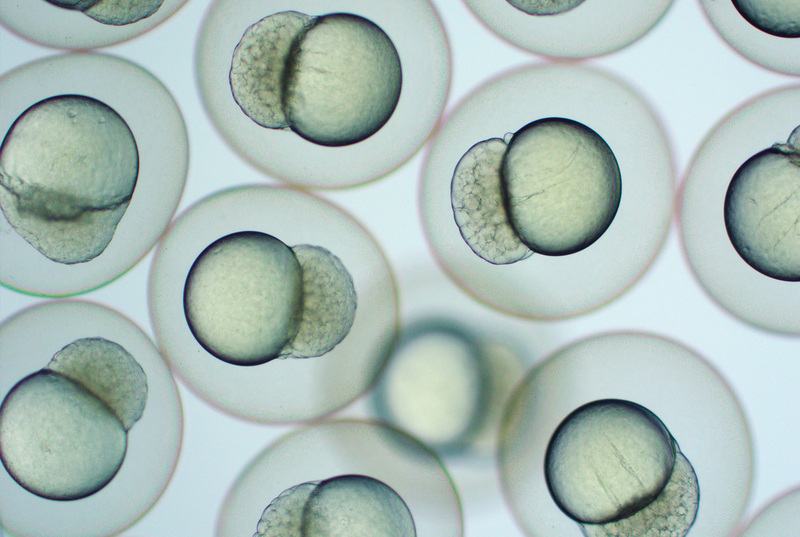 3-hour old embryos of the tropical freshwater zebrafish, Danio rerio. The team found an allometric relationship between embryo mass and metabolic rate – while larger offspring use absolutely more energy, they also use relatively less energy to reach the end of development, than smaller offspring. Larger offspring use proportionally less of their supplied energy to reach the end of development than smaller offspring. These findings are supported by the observation that hatchlings from larger embryos are both disproportionately heavier and retain relatively more of their initial energy reserves than smaller embryos. These findings mean that the same allometric scaling relationships that are found for adult body size also apply for offspring size. But they also may explain a fundamental pattern in life-history theory: allometric scaling with offspring size may serve as a widely applicable explanation for why larger offspring often perform better than smaller offspring. This research in published in the journal Functional Ecology.